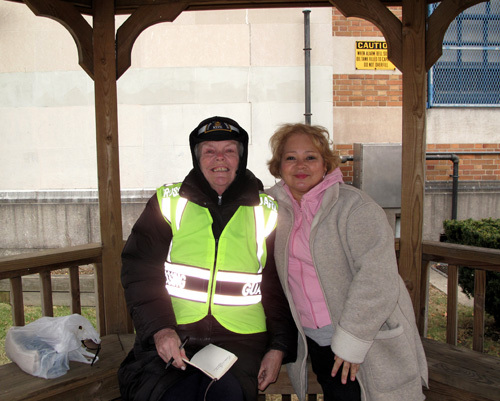 One freezing day in January, Diane Kennedy was keeping her friend, schoolcrossing guard Mary Ann Gudonis company under the wooden pavilion at P.S. 150 on 43rd Avenue. 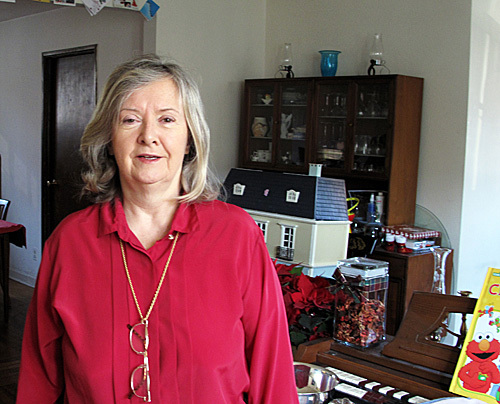 I had come to interview Mary Ann, but Diane Kennedy was eager to speak to me as well. A blond and cheerful woman, Diane is a retired secretary. She used to work at Elmhurst Hospital and has lived on 41st Street in Sunnyside since 1986.Diane likes her neighbors but says the social dynamics have changed a great deal over the years. While in the past neighbors used to meet in each other’s apartments, have coffee, play cards and go shopping with each other, now they all keep to themselves.“A younger crowd has moved in from Manhattan,” she says, “and the rents have gone through the roof.” If her apartment weren’t rent-stabilized, she wouldn’t be able to afford to live in Sunnyside. Since her husband passed away three years ago, Diane lives with and takes care of her disabled sister. Diane is very engaged with the local community. She attends the 108th precinct and community board meetings and sometimes volunteers at the senior center, where she helps older people fill out applications for public assistance or offers her cell phone to those who can’t afford their own phone. Three days a week, she works as “a companion” for a sick woman in Manhattan. Diane wishes there were more public parks in Sunnyside, because she finds it easier to meet new people in the park than in bars. She also wishes there were a large bookstore in Sunnyside. Sometimes Diane goes with her friends to Sidetracks, one of the few local bars where the patrons are of all ages. In this podcast Diane talks about how she met her husband when he came to buy a juicer at the store where she used to work. 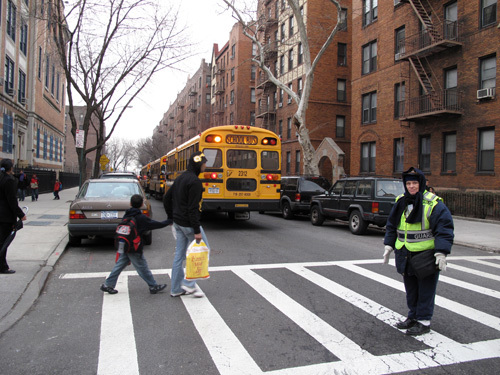 Dorothy Basilico has lived in Sunnyside for more than 50 years and has been a school crossing guard for more than 30 of them. She currently helps the children of P.S. 150 cross the street safely. Between duties Dorothy spends her time talking to her friends Mary Ann Gudonis and Diane Kennedy in the little wooden pavilion in front of the school. The three women cheerfully greet anyone who crosses their path.In the past, Dorothy says, “We had everything in the neighborhood. You name it, we had it.” Today many of the specialized stores have been replaced by large chain stores and fast food restaurants. Among the shops that Dorothy misses the most are Silvers, a clothing store, and the Golden Rule, which used to be on Greenpoint Avenue between 45th and 46th Streets. “You could get anything at the Golden Rule, towels, curtains, sheets…,” Dorothy raves.In the podcast Dorothy talks about her duties as a school crossing guard, how she sometimes has to fight with car drivers who refuse to stop for the children and with children who are hard to discipline. To name all the organizations and communal activities Dorothy Morehead has been a part of over the course of the last decades would take up much of the day. Most notably, Dorothy is a real estate agent serving Sunnyside Gardens and has been active in the preservation and beautification of the historic district since she moved to the neighborhood more than 40 years ago.“We are an extremely stable community,” Dorothy says. “If you want a quiet, clean [environment] and nature around you, you can’t beat Sunnyside. It’s wonderful here.”I spoke to Dorothy in the living room of her picturesque two-story brick house on 46th Street, which faces one of the large green center courts Sunnyside Gardens is known for. Designed after the English Garden concept, Sunnyside Gardens is known among architects and urban developers around the world. It was built between the years 1924 and 1930 for families with low and medium incomes who wanted to live close to city. After a long, contentious debate, the community was landmarked in 2007. Dorothy regrets that some residents don’t appreciate Sunnyside Gardens for what it is. Before landmarking took effect, some homeowners covered their yards with driveways and parking lots, put up chain-link fences and built extravagant annexes that clashed with the buildings’ original, down-to-earth style. The landmark opposition maintains that the strict stipulations for window and roof replacement, for example, make homeownership impossible for people with low incomes. In the podcast Dorothy talks about her various achievements within the community and her opinion in regards to Sunnyside Garden’s landmarking. 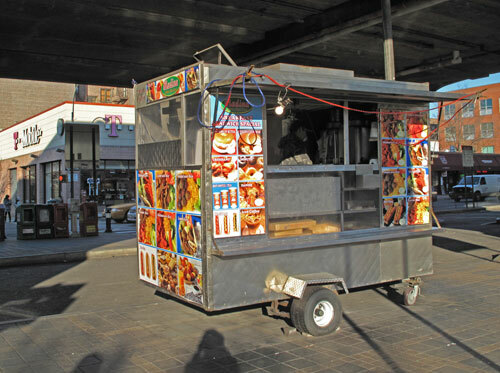 I spoke to Yousafi Jan Ali while a mechanic was repairing his Kebab cart under the 46th Street subway station. Loud traffic and subway noise enveloped us. The 37-year-old introduced himself as Ali with a broad, but utterly shy smile. He admitted his fear that his English might not be good enough for an audio interview. Ali, his wife, parents and three children fled Afghanistan in 2002. After the Taliban killed his cousin, his cousin’s family and some of his friends, he didn’t feel safe anymore in his native country. Ali prefers to live in Long Island, but likes Sunnyside. He despises the winter when he is exposed to the freezing cold and dampness. 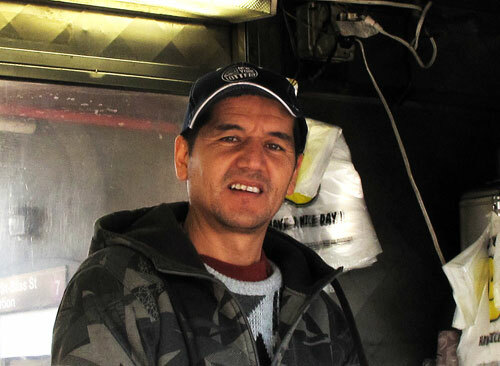 One year ago, when Ali started working in Sunnyside, his business was good. Over the last six months, though, it has dwindled. His clients, he says, are nice, working people. Only once on a weekend did he call 911, when two drunk customers refused to pay. The thieves escaped into the subway station and the police never showed up. Undeterred, Ali waves this episode off.